It’s been very busy the last couple of weeks doing all the last-minute things to get ready for the field. As a result, I haven’t been able to keep up with blog posts on everything, so I’ve spent part of the July 4th weekend catching up. That way, I can post catch-ups when I don’t have time to do something from that day (or when the day was so dull no-one would want to hear about it 🙂 ). A bit out of sequence, but that’s life. 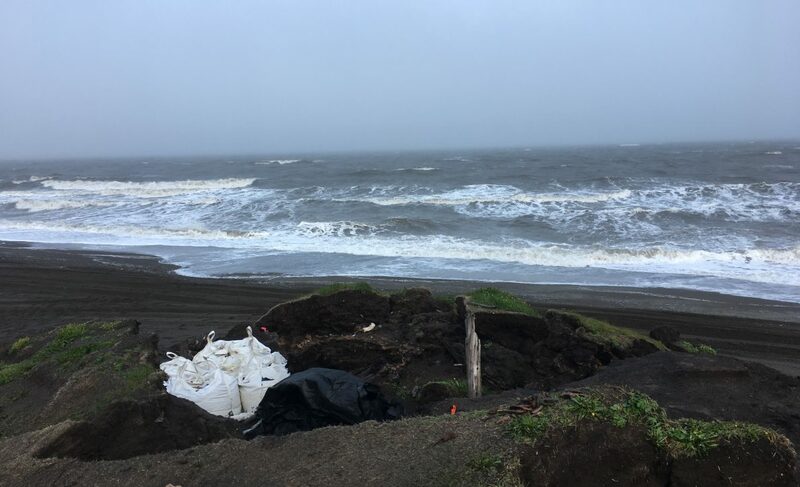 Unlike many projects, particularly in the Arctic, where the expenses of getting & keeping people in the field tend to make PI (Principal Investigators–the people in charge of projects) prefer experienced excavators with college backgrounds in archaeology/anthropology, most of our crew is made up of high school students who have never taken a course in archaeology. Obviously, there’s no way to give them (or any other normal human being) that sort of background in the time between hiring them and starting fieldwork. The good thing is, it’s not actually necessary. The skill set that an excavator or basic archaeological laboratory worker needs are actually learned on the job, not in the classroom or from books. Having worked with complete newbies (high school kids, Earthwatch volunteers, college field school students) as well as folks with advanced degrees (some of whom couldn’t have dug their way out of a paper bag if their life had depended on it) has proven this to me beyond the shadow of a doubt. That said, a bit of background does make it easier to understand why things need to be done a certain way, and therefore to remember to do them, as well as to not go crazy from boredom after the 25th sterile STP in a row. We do have a short reading list we send to college-level & higher folks, but for the high school students that’s not really the best plan. It’s summer, and reading is easy to put off, unless we want to start giving quizzes. Anyway, most high school students haven’t really gotten the knack of learning just by reading, since they almost never have to do that in high school, as far as I can tell (my daughter graduated recently). So I figured some type of exercise would work better. I wanted something fun, that could be done inside (people learn better when they aren’t too uncomfortable, as a general rule). There are a bunch of books that deal with various exercises people have developed to teach archaeology, so I went through those and found some stuff that looked good. Then I think I remembered my 6th grade teacher, who had developed a teaching method which relied on Milky Way bars (usually hurled from the front of the room to the student’s desk) as rewards for various achievements. It made for a lively classroom, and seemed to motivate kids who usually wouldn’t have cared enough about the subject to exert themselves. Being a good student, I got a lot of Milky Ways, which was ironic, since I didn’t actually like them that much to begin with. So, candy, but a variety of it. The exercise goes like this. 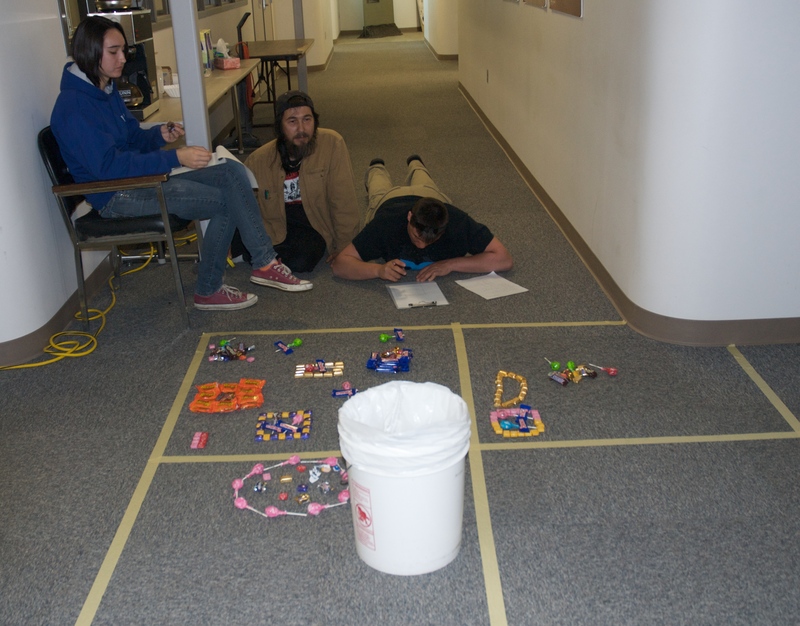 We lay out 2 2m x 2m units with masking tape on the floor (learning how to do units with hand tapes and geometry). 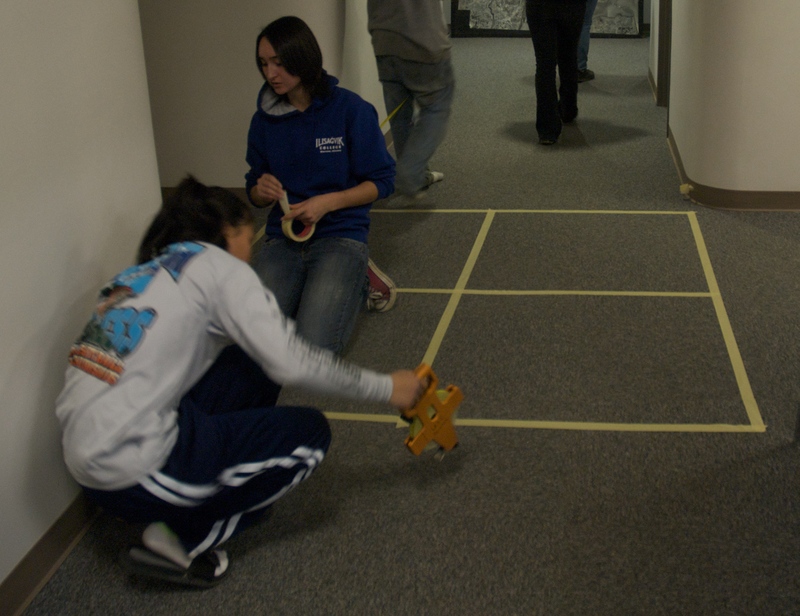 Nora and Victoria lay out a 2 x 2 on the hall floor. 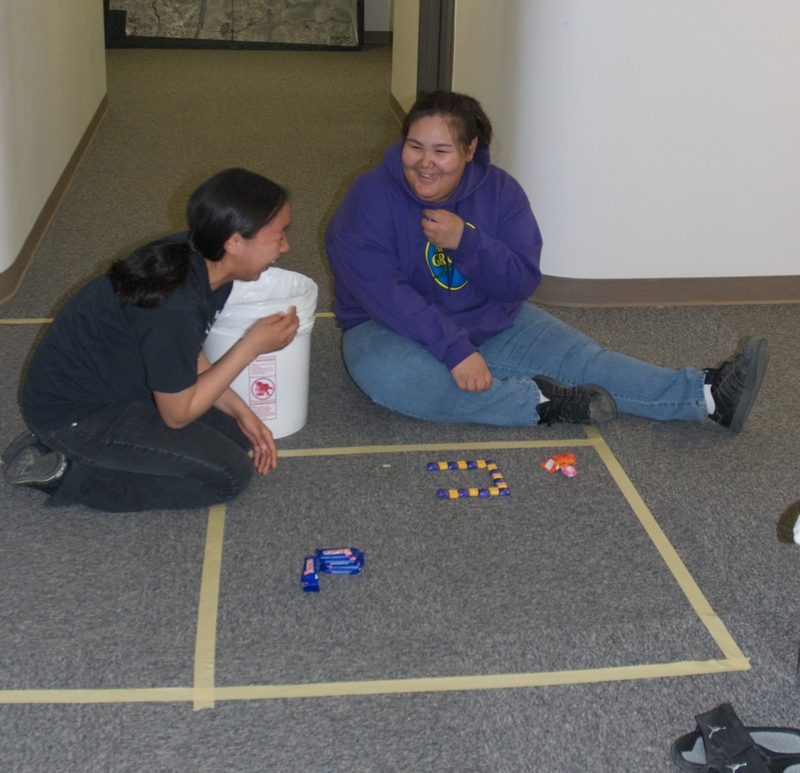 Then, two crew members who already have archaeological experience get to be the “actors,” which involves getting a big bucket with all sort of candy in it, and doing something in and around a 2 x 2. They can talk about it beforehand, and they can do whatever they want, talking or not. Trina and Heather start making something for the newbies to figure out! 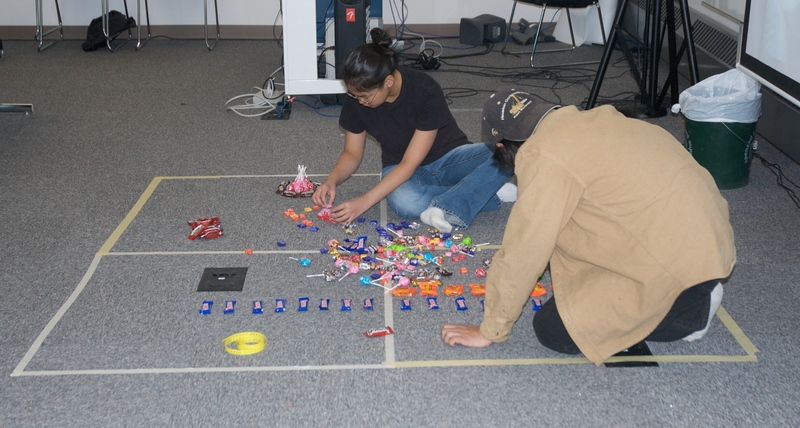 Flora and Ron create a site from candy in the conference room. Meanwhile, the newbies are divided into two groups. Each group is assigned to one of the 2 x 2s, where they have to act like ethnographers, recording what they see the “actors” do and say. Warren and Victoria play ethnographer. Nora carefully records what Heather and Trina are doing. Then the newbies swap places and practice mapping the site that they didn’t see being made, as an archaeologist would. We give them a bit of information on the kinds of choices (piece plotting, sketching, classifying things by color or type of candy, etc.) that they might need to make and why, what they need on a map (scale, key, North arrow) and let them figure it out. 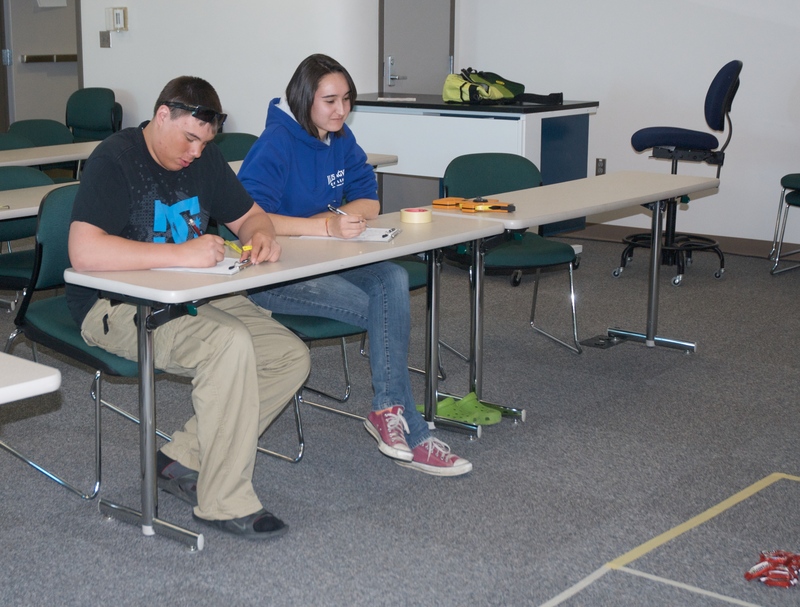 More experienced students help them with the mechanics, which makes a good review for them. Nora draws a map, while Trina & Heather give advice. Ron gives some pointers on mapping to Victoria and Warren. After that, we all get together, and I put up a picture of a “site” on-screen (digital technology is great for this!) and the “archaeologists” describe what they saw, and what they think it can tell us about the activities at the site. 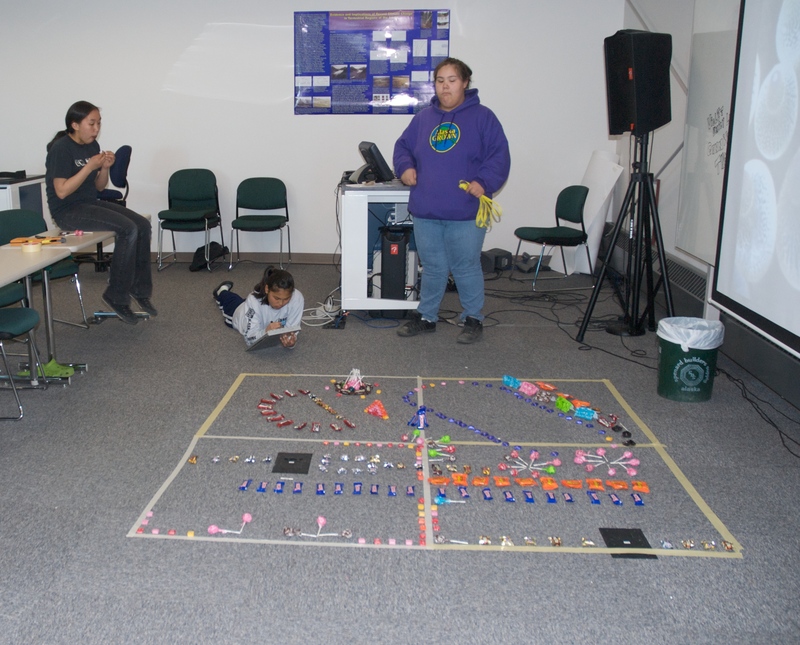 Then the “ethnographers” add what they saw, and we talk about how it can enhance (or change) the interpretation possible through material culture alone. Finally, the “actors” tell us what was REALLY going on! The exercise seems to get the general ideas about the possibilities and limits of archaeology and ethnography across to the students fairly quickly, without lots of jargon. It also shows them a lot about the point of recording proveniences accurately, and the difference between doing archaeology and just digging for artifacts. The candy makes it fun. And, we get to have the leftovers for pick-me-ups in the field!